Cache is an extracellular domain that is predicted to have a role in small-molecule recognition in a wide range of proteins, including the animal dihydropyridine-sensitive voltage-gated Ca2+ channel; alpha-2delta subunit, and various bacterial chemotaxis receptors. 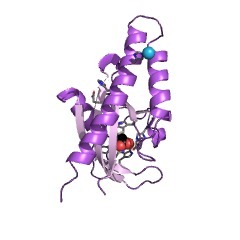 The name Cache comes from CAlcium channels and CHEmotaxis receptors. This domain consists of an N-terminal part with three predicted strands and an alpha-helix, and a C-terminal part with a strand dyad followed by a relatively unstructured region. The N-terminal portion of the (unpermuted) Cache domain contains three predicted strands that could form a sheet analogous to that present in the core of the PAS domain structure. Cache domains are particularly widespread in bacteria, with Vibrio cholerae. The animal calcium channel alpha-2delta subunits might have acquired a part of their extracellular domains from a bacterial source (PUBMED:11084361). The Cache domain appears to have arisen from the GAF-PAS fold despite their divergent functions (PUBMED:11292341). 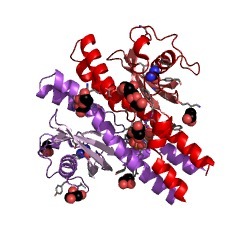 Cache is an extracellular domain that is predicted to have a role in small-molecule recognition in a wide range of proteins, including the animal dihydropyridine-sensitive voltage-gated Ca2+ channel alpha-2delta subunit, and various bacterial chemotaxis receptors. 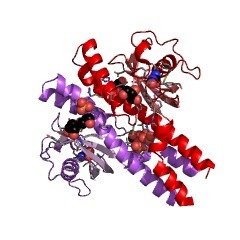 The name Cache comes from CAlcium channels and CHEmotaxis receptors. The Cache domain, also known as the extracellular PAS domain, consists of an N-terminal part with three predicted strands and an alpha-helix, and a C-terminal part with a strand dyad followed by a relatively unstructured region. The N-terminal portion of the Cache domain containing the three predicted strands could form a sheet analogous to that present in the core of the PAS domain structure. Cache domains are particularly widespread in bacteria, such as Vibrio cholerae. The animal calcium channel alpha-2delta subunits might have acquired a part of their extracellular domains from a bacterial source [(PUBMED:11084361)]. The Cache domain appears to have arisen from the GAF-PAS fold, despite their divergent functions [(PUBMED:11292341)]. 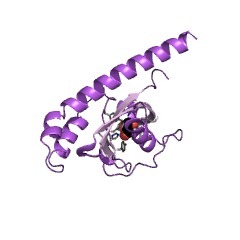 This entry represents the single Cache domain 2 (sCache_2), which contains the long N-terminal helix domain [(PUBMED:27049771)]. There are 15048 Cache_2 domains in 13761 proteins in SMART's nrdb database. Taxonomic distribution of proteins containing Cache_2 domain. This tree includes only several representative species. The complete taxonomic breakdown of all proteins with Cache_2 domain is also avaliable. Click on the protein counts, or double click on taxonomic names to display all proteins containing Cache_2 domain in the selected taxonomic class. Regulatory potential, phyletic distribution and evolution of ancient,intracellular small-molecule-binding domains. Central cellular functions such as metabolism, solute transport and signaltransduction are regulated, in part, via binding of small molecules byspecialized domains. Using sensitive methods for sequence profile analysisand protein structure comparison, we exhaustively surveyed the proteinsets from completely sequenced genomes for all occurrences of 21intracellular small-molecule-binding domains (SMBDs) that are representedin at least two of the three major divisions of life (bacteria, archaeaand eukaryotes). 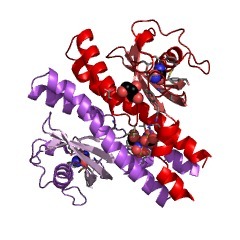 These included previously characterized domains such asPAS, GAF, ACT and ferredoxins, as well as three newly predicted SMBDs,namely the 4-vinyl reductase (4VR) domain, the NIFX domain and the3-histidines (3H) domain. Although there are only a limited number ofdifferent superfamilies of these ancient SMBDs, they are present innumerous distinct proteins combined with various enzymatic, transport andsignal-transducing domains. Most of the SMBDs show considerableevolutionary mobility and are involved in the generation of manylineage-specific domain architectures. Frequent re-invention of analogousarchitectures involving functionally related, but not homologous, domainswas detected, such as, fusion of different SMBDs to several types ofDNA-binding domains to form diverse transcription regulators inprokaryotes and eukaryotes. This is suggestive of similar selective forcesaffecting the diverse SMBDs and resulting in the formation of multidomainproteins that fit a limited number of functional stereotypes. Using the"guilt by association approach", the identification of SMBDs allowedprediction of functions and mode of regulation for a variety of previouslyuncharacterized proteins. Cache - a signaling domain common to animal Ca(2+)-channel subunits and aclass of prokaryotic chemotaxis receptors.